When we think about improving our immune system, most of the time it’s what we need to do or what to eat or drink.. Long story short, another tip is to relax and put your feet up to increase your immune function! Getting sick after a stressful event is not a co-incidence. As you’re aware, everything in the body is connected – your brain and your immune system are in constant communication with each other, which means that psychological upsets can result in physical symptoms. 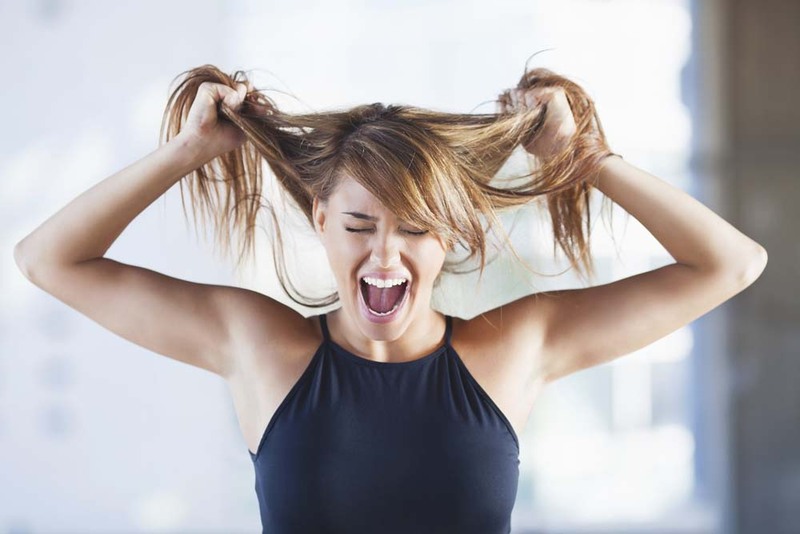 The chemical reactions triggered by stressful situations result in an onslaught of stress hormones like cortisol being pumped around the body. While these hormones are beneficial in acute or short-term situations, if they linger for a longer period of time it can result in inflammation, reduced immune function and a higher susceptibility to infection. Stress is our body’s natural response to something that could harm us – it’s our inbuilt alarm system. We’ve all heard of the “fight or flight” response, this is our body’s natural way of responding to a threatening circumstance and it is a normal, healthy response. One of the things that happens to our body when we have a threatening event is that we have a release of adrenaline – this gives us a burst of energy to run away from the danger or tackle it head-on. The issue with this response is that our modern-day way of life has many more triggers, making it go from the short-term response it was meant to be, to a drawn-out exhaustion of our body’s resources. 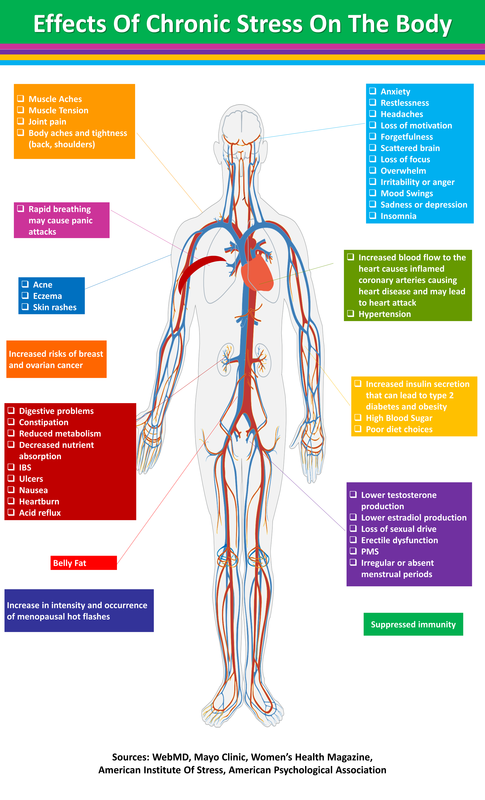 What happens to our body when we are stressed? We have large levels of adrenaline in our body to give us the energy to run or fight. - Long term – our adrenal glands don’t ever get a rest or chance to switch off this production of adrenaline, until eventually we are in adrenal fatigue – a classic cause of chronic low energy. Our digestive system is switched off! Who needs to digest food when we are running away from a bear? - Long term: this means our digestive systems are slow, with constipation or diarrhoea, food sensitivities, inflammation, allergies, bloating, flatulence. - Long term: we forget how to breath with our diaphragms, meaning our oxygen exchange is less than optimal and we use our accessory muscles to breath which results in tight necks, shoulders and headaches. We struggle to fall asleep. Who wants to be tired when we are in danger? - Our immune system is suppressed due to the amount of cortisol (stress hormone) being secreted to our blood stream. So in summary: Short term stress = Okay. So aside from ‘switching-off’ mentally at any given opportunity, how else can we reduce stress to improve our immunity? Making sure you’re getting adequate sleep in a regular routine is very important. Disrupted or insufficient sleep increases your cortisol levels, which impedes your immune function. The diaphragm is our main breathing muscle. It is below the lungs and should be used every time we breath. Few of us actually use it though as we are stuck in the fight or flight response. Using our diaphragm to breathe allows full oxygen exchange in the lungs and actually stops the fight or flight response, allowing our body to return to the “rest and digest” mode. Take the time to focus on your breathing 20 minutes per day to enhance your immune system as well as your heart and brain. 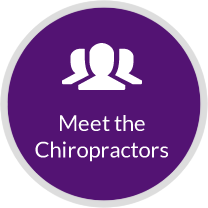 Chiropractic care can help to switch off the fight or flight response and turn on the rest and digest part of our nervous system. Studies have shown chiropractic care improves immune function. Furthermore, Chiropractic care can support you to be able to exercise better and breathe better, which also boost immune function. It’s a win-win! 1975 Ronald Pero, Ph. D. Chief of Cancer Prevention Research. NY Preventative Medicine Institute.